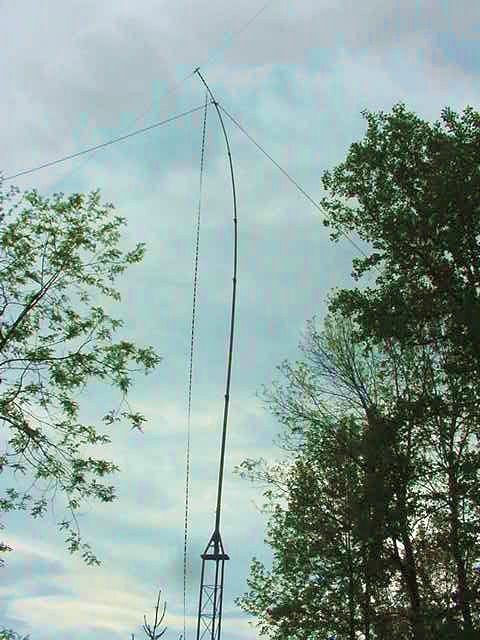 I experimented with several homebrew antennas in 2007, and do have a few that perform well. In the quest for more DX, though, "longer" and "higher" is generally better. I cleared out a bunch of trees in the fall of 2007 for the 33' vertical in the field above the house, that project worked out well, and provided a lot of firewood, enough for the forseeable future. I then got to thinking of a way to put up some kind of all-band doublet as well, and finally ironed out the details of this project. 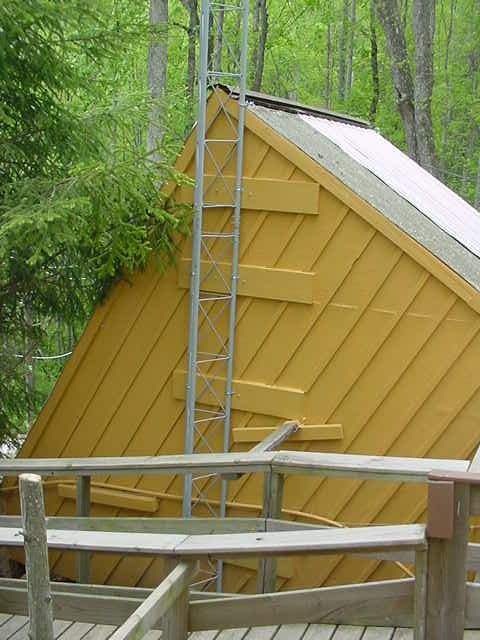 At one time there was about 50' of Rohn tower attached to the house (originally for a wind generator), and I needed to have it taken down around 2000 when adding a few new rooms, as it was on an inside "L" of the house which would become an indoor portion. These sections had been lying in the woods ever since. They needed a new paint job and a few reinforcements. In this current project, I've only used 3 of the 5 sections, two standard sections and the top section which has a length of 3" mounting sleeve at the top. Almost 30' of it is now bolted to the side of the shed, and I got a 42' set of telescoping fiberglass push-up masts from Max-Gain in Georgia, to mount at the top. On top of this is where the inverted V doublet would be mounted. The higher sections of the mast seemed to get a bit floppy at their maximum extension, so I allowed the sections to telescope more (making it about 30' total rather than 42), and this set of masts is set on the top rung of the tower (going through the mounting sleeve), so that the bottom of the lowest piece is at about 26' above where the base of the tower enters the concrete. 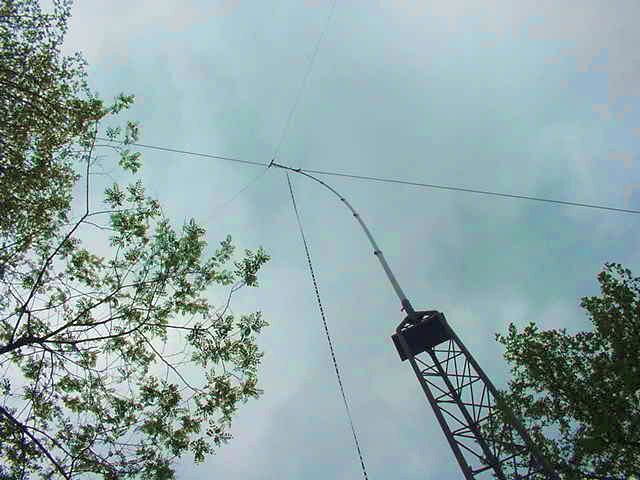 This puts the top of the mast about 56' above ground. At the very top are 2 ceramic standoffs wired together with steel cable through a hole in the top mast section. Attached to them are two sections of 14 gauge insulated stranded THHN cable, each a good 130' in length, one going north to an insulator/rope/tree connection uphill on the mountain slope, and one in the south direction (not quite 180 degrees from the other, a bit southeast), but best routed to minimize the run above the guest room roof, which is metal. 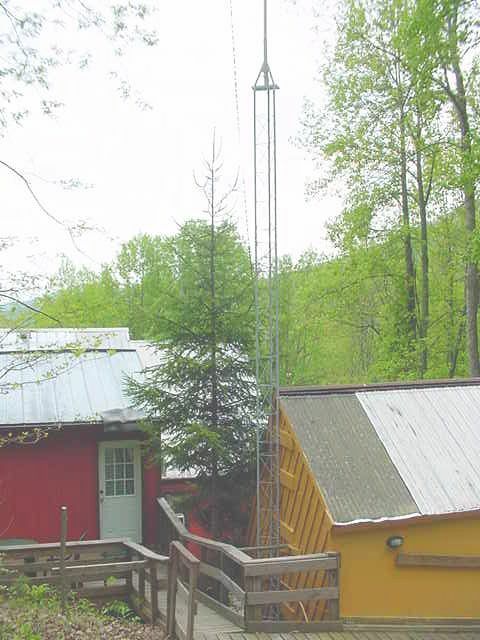 Attached to the two elements is 100' of Wireman 450 ohm window line running to the shack room on the upper level of the house, into an MFJ-919 4:1 current balun and then a short length of coax to the antenna matchers and rigs. All joints were coated very well with silicone to resist the weather. 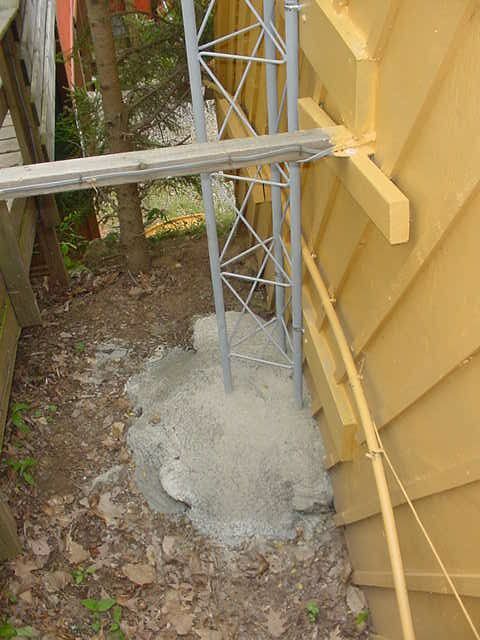 In the first picture, you can see the concrete pad, about 500 pounds of concrete at the bottom, and the base is about 3-4' lower than the deck walk next to it. Just to the south a few feet, the ground level drops another 10-12' to the driveway/garage area below, giving it a bit more elevation theoretically, although the wire does have to pass over the metal-roofed guest room at the left (about 45' above it, see 3rd picture) for several feet before being above higher open ground again. On the side of the shed are four 2x8 boards attached flush to the exterior wall, and these boards are set with long spiral nails into the interior studwork at 4 locations each, and the tower is bolted to this assembly with thick lag bolts and clamps. I had to cut away sections of the diagonal battens to do this, and luckily I had a small amount of the yellow paint left to make it look consistent. At the roof level, there are two heavy-duty steel cables attached to the tower running across the top of the roof and bolted to the front side for extra strength in any situation. A view of the entire tower, just under 30', the deck walks (at a somewhat higher level) and the guest room at the left. At the very top of the mast you can see the ceramic standoff "T" and then faintly the two main element wires heading north and south. The top still flexes a bit due to the tautness and the fact that the two elements are not completely 180 degress in a straight line. The slope corresponds to the slope of the mountain on which the property lies, downhill to the south and uphill to the north, but the wires maintain a similar height above ground in both directions, gradually decreasing at the ends to about 20' or so. To the left of the mast you can see the free-dropping window line, and the other two lines to the left and right are the heavy polyethylene rope guys which support the mast in the other two directions at 90 degrees from the direction of the elements. One last view, zoomed in, looking up from the base of the tower. I've finally been able to get on 160 meters (barefoot) with this setup, and received good signal reports as well as a flat SWR. On all the other bands, it also tunes up well, with and without my SB-200 linear. The gain on RX is definitely better than my other antennas, and I've not had need for the pre-amp. Good signal reports all around. Let's hope it stands up to the weather, and brings in some new DX, then I'll be a happy camper.